WASHINGTON — With the Islamic State just miles from its border, Turkey is now facing its most severe security challenge in decades. In response, the Turkish government is seeking to accomplish the impossible; Ankara wants to fight the Islamic State, carry out regime change in Syria and roll back Kurdish autonomy all at the same time. The risk of this overambitious approach is that it could end up accomplishing none of these objectives while squandering the opportunity to contribute to the stabilization of the region. Underpinning this risky strategy is a questionable assumption and an equally dubious policy decision. Turkey assumes that remaining indifferent to the fate of the besieged Kurdish enclave of Kobani will not imperil its peace negotiations with Turkey’s own Kurds. 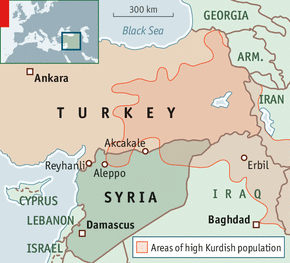 Ankara has done little to assist the Kurdish enclave, ruled by an offshoot of the outlawed Kurdish Workers Party, or P.K.K. In Ankara’s eyes, the Syrian Kurds fighting there are essentially allies of Bashar al-Assad’s government in Syria. Moreover, Turkey is uncomfortable with the degree of autonomy obtained by the Kurdish region in Syria as it could eventually become a stepping stone for the creation of a larger and independent Kurdish entity in the Middle East, which could in turn fuel secessionist tendencies among Turkey’s own Kurds. Finally, Turkey seems to believe that despite its policy of active neglect as the Islamic State shells the Kurds in Kobani, the P.K.K. will not terminate the prevailing cease-fire and decide to fight both Turkey and the Islamic State at the same time. This assumption is now undergoing a stress test. Many Kurds have decided to demonstrate their dissatisfaction with violent street protests, forcing the government to declare a curfew, for the first time in many years, in five predominantly Kurdish cities in Turkey’s southeast. They blame the Turkish government for not doing enough to save Kobani and for hindering Kurdish efforts to bring aid and fighters to the enclave from across the Turkish border. The Kurdish leadership even threatened to pull out of the talks should Kobani fall to the Islamic State. Indeed, the peace talks with the P.K.K. that until recently seemed on track are now at risk of derailing. Even riskier is the policy decision Turkey’s leaders have taken in the past week. The Parliament adopted a bill allowing the government to send troops to Iraq and Syria to fight terrorism. This was rightly interpreted in the West as a belated commitment by Turkey to be part of the anti-Islamic State coalition. But Ankara is demanding Washington’s support for regime change in Syria before engaging itself more substantively in the fight against the Islamic State. Turkey sees the Islamic State as a symptom rather than the cause of the problems that bedevil the Middle East. It believes that only a comprehensive and ambitious campaign targeting the Assad regime can help to stabilize the region in the long term. Hence Turkish leaders are demanding safe havens and no-fly zones within Syria. These protected areas would cater to the accommodation needs of future waves of refugees but also serve as an assembly and training zone for more moderate Syrian opposition fighters. But Turkey’s stubborn emphasis on regime change in Syria is finding little support in Washington. For the United States and for much of the Western world, the Islamic State remains the core threat. Therefore Turkey’s policy of conditioning its anti-Islamic State engagement on support for an anti-Assad campaign will be at best ineffective and at worst counterproductive. Rather than making futile demands of its allies, Turkey should instead use its role as an essential partner in the fight against jihadism as leverage to gather more substantial aid to better manage the complexities of caring for a massive refugee population. It can start by allowing multilateral institutions such as the United Nations and the World Bank to play a much bigger role in this long-term endeavor. At the very least, Ankara and Washington should jointly work on a humanitarian action plan to save the thousands of remaining residents of Kobani from slaughter. Neither nation can afford to witness the shock of another Srebrenica, perpetrated by Muslims against other Muslims, a few miles from Turkey’s border. Turkey simply can’t afford to keep regime change in Syria at the top of its foreign policy agenda — certainly not at a time when a brutal jihadist entity is consolidating its position just miles from Turkey’s border and peace talks vital for Turkey’s own national security are at risk of collapsing. The government must reorder its priorities. An overemphasis on bringing down Mr. Assad weakens Turkey’s ability to deal with the immediate menace posed by the Islamic State, the imminent threat of resurgent P.K.K. violence, and the more permanent challenge of an increasingly dire refugee situation. Sinan Ulgen is a former Turkish diplomat and the chairman of the Istanbul-based Center for Economics and Foreign Policy Studies, also known as E.D.A.M.